Happy Friday! As I mentioned in Wednesday’s post, the weather around here is hella weird. It was freezing cold + rainy one day, and 70 degrees the next! I wore this outfit last Thursday when shopping around Dallas with my mom. 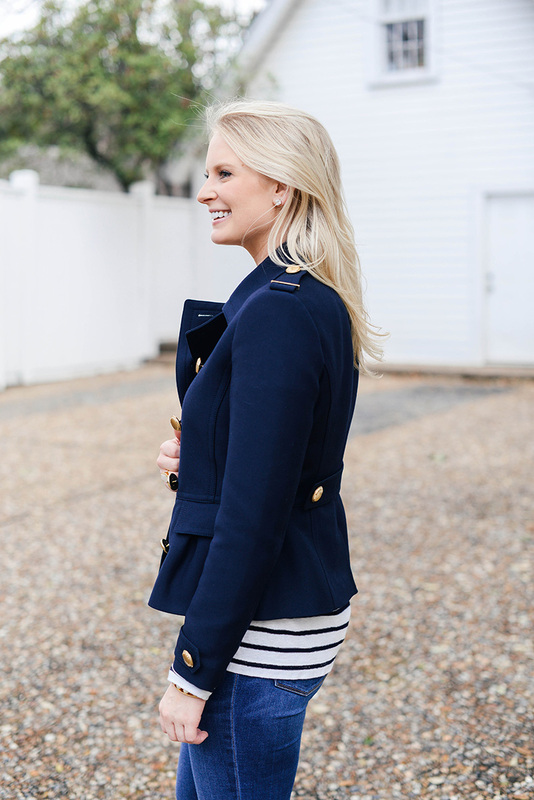 I’ve been loving this Burberry jacket I picked up earlier on in the fall! 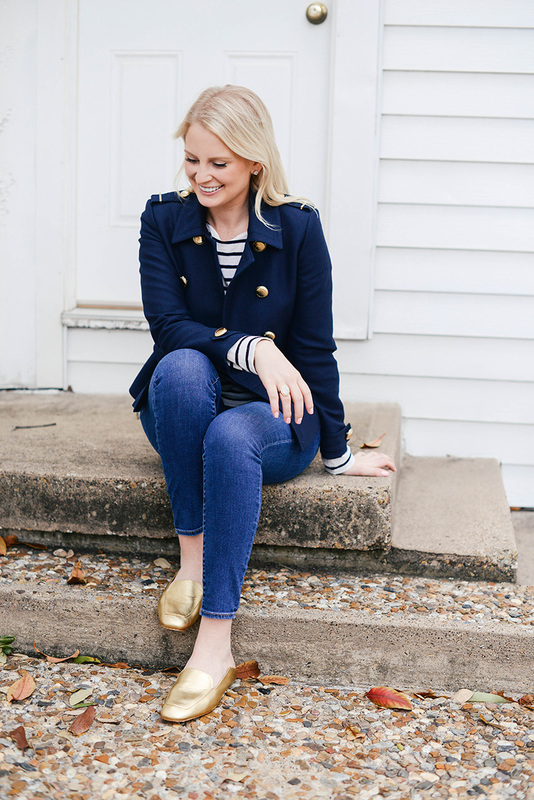 It’s such a gorgeous staple to throw on over tees and blouses to wear with jeans. I’m comfortable but still look polished… the best of both worlds! You may also remember these Tibi loafers? I already have these in black (such an effortless slip-on!) 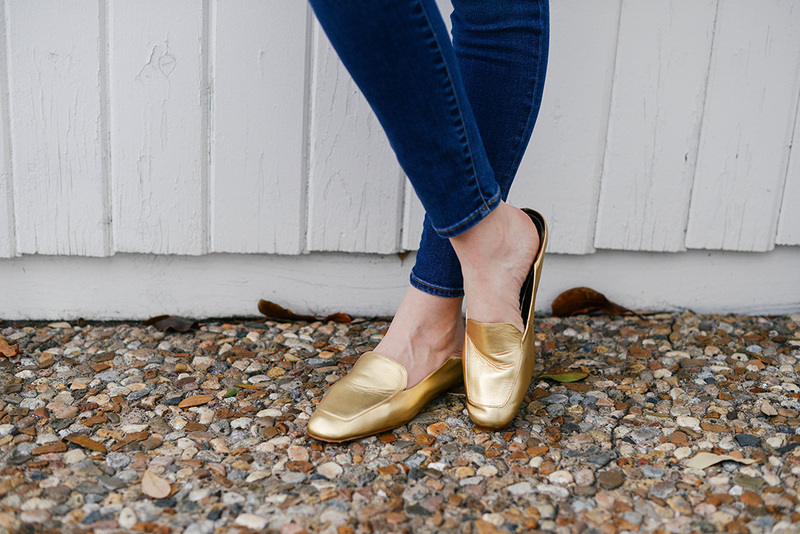 and wore them a bunch this fall, but as a little holiday gift, the Tibi team sent me this gold pair! Such a festive and fun color for the holidays, certainly, but I’m loving wearing them now with my favorite skinny jeans. I bet they’ll look adorable with white shirt dresses this spring too, don’t you think? If you were following along during NYFW in September, Tibi’s upcoming spring collection is to die for! In addition to juicy new colors, the collection features a fun play on proportions and volume – as you can imagine, it’s right up my alley. Below are four looks from the runway I can’t wait to show up in the new arrivals section – pretty sure I’m going to need that punchy poppy mini dress!! Tibi’s immensely popular off-the-shoulder top now comes in a belted midi dress! Nobody does minimal chic like Tibi, and this dress is just that. Love it in Ribbon Red! These wide leg pants would make for a cool work wardrobe separate, or dress them down on the weekend for a fashion forward look. I always say you can never have too many white tops, and this shirt is next on my list. The shirred detail at the neckline is very unique and fab! I’ve clearly got a thing for special sleeves this season, and the billowing ones on this cheetah-print dress have me drooling. Love this jacket! So cute and perfect for spring! Love this look, Merritt!! Those gold slides are fabulous!